This is such a fun treat to eat. I love love eating with my hands and lickin' my fingers. Plus, unlike other finger foods like french fries or chips, its healthy! My mom used to steam the artichoke and we would would use some sort of a mayonnaise to dip. I chose to steam then roast it for a smoky flavor and to add some color. And since were eating a vegetable here, I thought a butter sauce for dipping was appropriate, don't you think? I thought so. 1 Wash artichoke thoroughly and trim the pointy ends off the leaves. Trim the stem off. 2 Place a medium pot with about 2 inches of water and a steam basket inside. Place a bay leaf inside and boil water. 3 Place artichoke on steamer basket and cover for about 25-30 minutes until tender. 4 Slice artichoke in half from tip to end and scoop out the center fuzzy choke. I used a spoon for this. 5 Drizzle artichoke halves with olive oil and kosher salt and place in toaster oven cut side up at 400 degrees for about 15-20 minutes. 6 Prepare a dipping bowl with melted butter from the microwave. Also, prepare a bowl for the discarded leaves. 7 To eat, pick leaves, dip in butter sauce, and scrape the artichoke meat off the root of the leaf using your teeth. Discard the leaf when done. Once you pick all the leaves, you are left with the artichoke heart and this part is completely edible. And delicious. I would have picked those up with one hand and chewed....while sipping on butter...they look perfect. I like that these are roasted after steaming; great for the texture! The roasting must impart a great flavor. I will definitely try it. My grandmother always made fried breaded artichoke hearts as a thanksgiving side dish and thus I have always had a special place in my palate for this vegetable. Your preparation is so simple and traditional - I love it. I don't know how to eat an artichoke..lol! This is not very common here..but it looks like something i would gladly dip my hands into..
Artichokes are one of my favorites and I can't wait to try this! It sounds simple enough that even I can do this! Artichokes are one of my favorite things! They look fabulous! OMG you just wrote about one of my fave preps for Artichoke. I recently got turned on to this from the Hitching Post restaurant. YUM! IMO, roasting is the best prep for it. 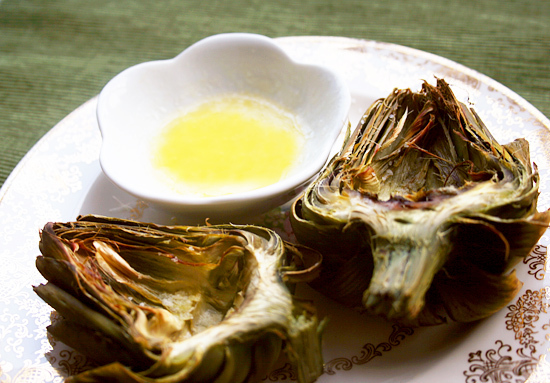 Nice blog, great look - and I love grilled artichokes! That photograph took my breath away. I am sure its just as delicious! An ideal summer finger food. Simple really is best with these. Must try them roasted rather than pan grilled. Thanks for the tip. These look delicious! I have always had artichokes with either mayo or remoulade and they are usually always steamed. I will definitely have to try the roasting method, I have a feeling that adds a wonderful flavor. These roasted artichokes look fabulous! I have never roasted them before, I bet it really intensify their flavor. I find artichoke very tasty. It is good for health. It is rich in iodine. It reduces cholesterol and improves blood circulation, it is also helpful for diabetic people and is great for liver. It is also good for hair and is excellent treatment for eczema It has many more uses and benefits.